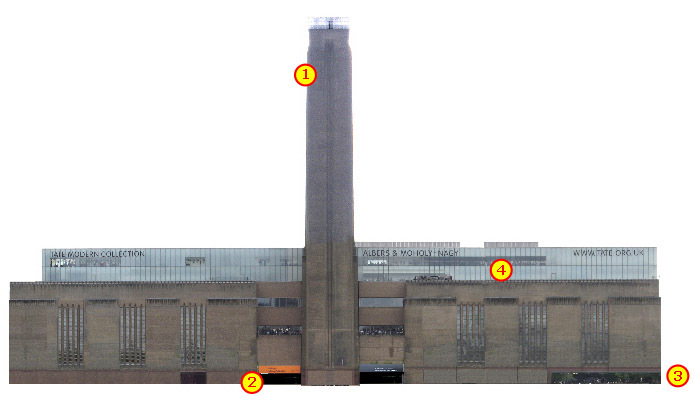 > The Tate Modern art gallery is in the former Bankside power station. Sir Giles Scott who designed the building was also the designer of Battersea power station and, on a smaller scale, the famous London red telephone box. > The tall chimney has been capped with lights to become a landmark beacon at night (1). > Entry to building is most dramatic by going down the ramp at the western end (3) rather than using the side doors (2). The ramp leads you directly into the vast, 100ft high turbine hall. > During conversion, two storeys were added to the roof - the glass 'beam'. The restaurant is located here (4). > Tate Modern is famous for work by Rothko, Matisse, Dali, Cezanne and Picasso, and contemporary works by Matthew Barney, Chris Ofili and Gerhard Richter. Also for the large-scale commissions in the turbine hall.